The first man in space would have turned 80 on March 9, 2014. In honor of his birthday, Russia Beyond presents a list of stories about the famous cosmonaut. Yuri Gagarin’s selection as the first man in space changed history, but it also changed his life. Here are six things you might not know about the first man in space. Gagarin was often asked whether he had seen God in the cosmos. “Just a little bit more,” he said, “and I might have met God.” Gagarin knew the risk he was taking going into space. Four times before his flight, mannequins were launched into orbit, and one of them burned up. This information was kept in the strictest confidence, but everyone knew that there was a real chance that Gagarin might not come back from space. Until April 12, 1961, there was no proof that a man could survive such a trip. But Gagarin was from generation of wartime children who dreamed of great deeds and sacrifices; the opportunity to go to space gave him a chance to make this dream come true. His flight on the Vostok spacecraft lasted 108 minutes – enough time to make him an international star. Gagarin later recalled that there were two situations in flight that nearly cost him his life – one during orbit and another as he was landing. “I decided not to tell Earth, not to raise panic...” he later said. Gagarin and nine other potential cosmonauts trained at Star City. They were taught to endure loneliness, physical exhaustion and pain. Excellent health was one of the requirements to be considered for space flight. “Doctors tapped with a hammer every bone, checked the work of all organs – from the heart to the vestibular apparatus,” Gagarin said later. Then came a series of tests during which a voice heard via headphones suggested to the testee obviously wrong answers. The point was to teach a potential cosmonaut that in an extreme situation, he could rely only on himself and his training. No special talents distinguished Gagarin from the others. He was athletic, not very tall, but very active, and well-coordinated. However, the tests for potential cosmonauts were not limited to checking physical ability. General Nikolai Kamanin, the head of cosmonaut training, spent a lot of time with the future space men. He worked very hard on determining and shaping their moral and political character. Journalist YaroslavGolovanovcalledKamanin “a man without a sense of humor, a convinced Stalinist.” However, everyone knew that the first space flight would have ideological implications. Apparently, Gagarin fit Khrushchev’s idea for the face of the Soviet Union: someone who was open, confident in his own strength, a little bit silly, a regular guy from the regions, not a polished officer from the city. But of course it helped thatGagarin was really a good pilot and a brave man who treated training seriously. He spent hours in the gym and took grueling cross-country runs every morning. After his flight, Major Gagarin, traveled the world without a break, glorifying the Soviet way of life. Two skills were required from him during these trips: the ability to drink an unlimited amount of alcohol, and the ability to give toasts. The astronaut possessed both skills to perfection. Famous actors, writers, heads of governments and even the Queen of England were Gagarin’s drinking buddies at various times. When his travels ended, Gagarin was a bit at loose ends. He suffered from depression, confusion anda sense of uselessness. The car, apartment and other benefits given to Gagarin by the state could not compensate for no longer being the center of global attention. Unable to overcome his depression, Gagarin started drinking heavily. Rumors about his alcoholic escapades spread across the country. The most famous of his drinking stories happened at the Black Sea resort of Foros. After getting drunk, he jumped from the balcony of his hotel. Gagarin fractured his skull and face and spent a month in the hospital. To repair this “face of the country,” he underwent plastic surgery – something almost unheard of in those days. Despite the repairs to his face, in photographs from the mid-1960s the first cosmonaut looks sad;the smile that dazzled the world in the days of his historic flight had disappeared. 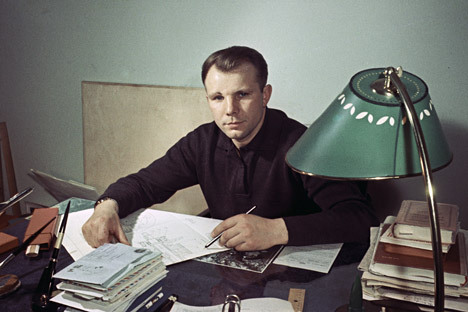 He was appointed commander of the cosmonaut corps, and in June 1966, Gagarin began training within the framework of the Soyuz program. Nevertheless, he continued suffer from depression and continued to drink heavily. He told his friends that his career was over. In the sky, Gagarin felt better than on the ground. He was a professional pilot, and aviation gave him the feeling of being useful. In the last years of his life, he flew continuously. Almost every day he came to the Chkalovsky Airfield and climbed into the cockpit of a MiG. One such day was his last. During a training flight, Gagarin crashed his aircraft. It was rumored that he was drunk when he got into the cockpit. There were other versions of the accident, including allegations of murder or suicide. The weekly tabloid “Top Secret” wrote that actually Gagarin did not die, but was kept in a psychiatric hospital for rebelling against the policies of Soviet leader Leonid Brezhnev, and the Bulgarian prophetess Vanga said that Gagarin did not die, but was “taken up to the sky. ”These rumors contributed to Gagarin’s larger-than-life story. But this legendary figure simply died in an accident, like many other test pilots before and after.